The inspired ideas and emotions one experiences when taking in the sights of nature, reading about the subject, or seeing a film with beautiful landscapes, can range wildly, from those of awe and wonder to absolute terror. I’ve come to believe that once humans banded together to hunt and farm, communicate effectively, and build communal living areas, the species irrevocably lost any direct association with natural surroundings. We were left with only the ability to examine the inner biological mechanics of being for understanding what is called “nature.” We were destined from an early time as persistently self-aware beings to be removed and isolated observers of the planet’s natural wonders, no matter how in awe we are by such magnificence. Ideas about the relationship of Man and his natural surroundings are examined in fantastic detail in Albrecht Altdorfer and the Origins of Landscape by Christopher S. Wood, who is Professor and Chair of the Department of German at New York University. Professor Wood’s book is an incredible achievement in art historical theory and research. It investigates a single daunting question: What motivated the German Renaissance artist Albrecht Altdorfer (1480 – 1538) to paint the very first stand-alone landscape paintings in human history? How did a European world completely centered on religion, with its arts engulfed in religious or classically-themed pagan iconography, end up with an artist creating pictures either with no humans in them at all or as tiny figures in overwhelmingly dense forest settings? Professor Wood thoroughly examines the mindset of the artists of the German Renaissance era in which Altdorfer worked, a much less studied locality than that of the Italian and Flemish schools. He also examines the implications on his thesis drawn from the scant information in the historical record about the artist’s personal life. The book has beautiful reproductions of the works by German masters of paintings, drawings and prints, many in color, lending themselves well to deep meditation on its themes. 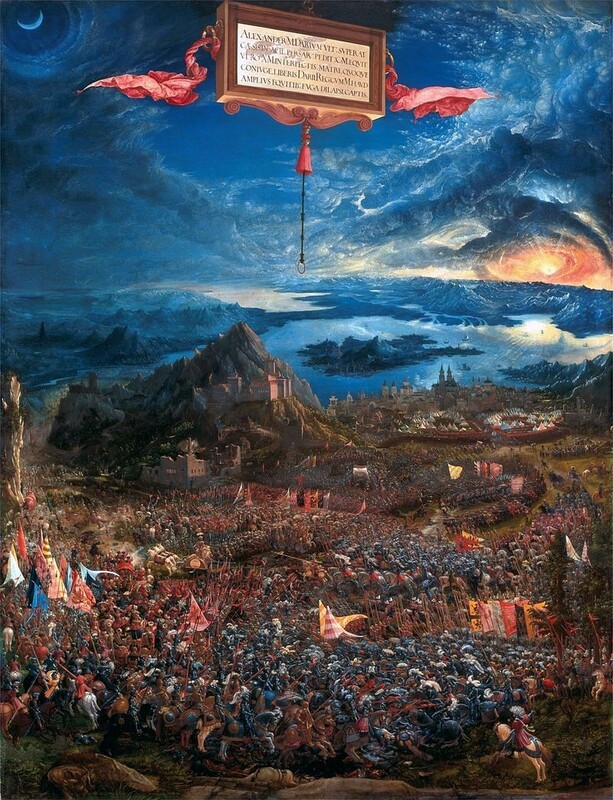 Altdorfer was caught between the rising tide of Martin Luther’s iconoclastic teachings (Luther was alive and active during his time) and traditional Christianity as practiced out of Rome, but he never completely gave in to the former. Professor Wood notes that as the landscape setting encroached on the religious saints and the pagan heroes in paintings, certain aspects of the primeval forests took on their attributes in an odd substitution of sorts. Joachim Patinir, the visionary Netherlandish painter who set his small figures from Christian tales amid beautiful panoramic views of mountains, waterways, lush trees, and forests, is cited as a proponent of the widespread idea at the time that nature’s beauty is subservient to the religious experience and story. However, Altdorfer’s revolution swayed towards evincing the fear and harshness evoked by the dense forests of his native Germany as an independent entity, with no relationship to the stories of the Bible or Classical literature and myths in any way. In the long run, one also can see in these frightening German landscapes the source of a nationalistic pride in their terrors. This attitude eventually leads as an almost natural path to the unflinching murderous apects of National Socialism. Taking on landscape from a different direction is Alejandro G. Iñárritu’s 2015 film The Revenant, starring Leonardo DiCaprio as Hugh Glass, a guide for trappers in the 1823 wilderness of America. After his group are attacked by an Arikara Indian war party, whom the film also follows as they search for the Chief’s kidnapped daughter, they are forced to hide the furs they’ve gathered. Abandoning their boat, they make the long trek on foot through the harsh terrain back to the safety of their fort. Along the way, Glass is horribly wounded in a bear attack and it is decided that two men, Fitzgerald and Bridger, along with Glass’s half-Pawnee Indian son, will remain with him while the others continue in greater haste to safety to get help. The greedy, brutal Fitzgerald, played by British actor Tom Hardy, completely unrecognizable with his wild eyes, scarred head from an earlier Indian attack, and magnificently cadenced American accent, murders Glass’s son and leaves Glass to die. He and the young Bridger, from whom he’s concealed his crimes, then make their own way back to the snowbound fort. The movie displays some of the most startlingly beautiful scenes of landscape shown in film history. Few of us can say we’ve seen these isolated scenes of wonder in person. The rub is that we’re seeing and experiencing them either in a movie theater or at home on television. We are thoroughly divorced from their tangible reality. The scenes in The Revenant, shot in Canada, America, and Argentina, call on us to say, “I can’t believe I live on the same planet where these forests and mountains, waterfalls and rivers, exist at this very moment.” It’s almost like another world, completely independent from our reality. During The Revenant’s scenes of incredibly harsh violence, Iñárritu pans the camera on the surrounding environment and amplifies the rustling of trees shown trembling wildly in the cold, as if nature itself is admitting to the terrible and cruel conditions in which the planet must live in. Glass drags his torn up body through the grueling terrain because he is bent on having his revenge on the soulless Fitzgerald. He is engulfed by a desperate instinct to kill the man who has murdered his son, and Iñárritu seems to imply that by living in this beautiful yet merciless landscape, there is a natural progression that mankind will revert to animalistic behavior. Violence is thus viewed tragically as an inevitable and inherent reaction to the natural landscape in which the species lives. This is in spite of all of man’s self-awareness of his unique situation in the animal world. Although the movie’s characters, from the fur trappers to the Indian tribesmen, resort to such violence, the Native Americans seemingly live closer in spirit to the land than the Americans or Europeans. Glass, during his painstaking journey to the fort, chances upon a Pawnee man also suffering from the elements, who helps Glass. This unexpected kindred spirit feeds Glass, shares his horse, and tends to his wounds (he is later found by Glass hung from a tree with a French sign on his body callously mocking him as a savage). In the riveting scene where Glass first meets him, the Pawnee chants his own story of sorrow while looking up in defeated resignation into the cold night sky. Iñárritu purposely does not have the character’s voice exactly match his lips as he speaks, as if the tale of displacement, loss of family, of wandering, is a song for the ages, the sorrowful tragic tale in both the undocumented and recorded history of mankind’s violence. The lesson from Professor Wood’s book and from the film may be that the pervasive violence of the human species is the inevitable outcome of living in the midst of harsh and beautiful nature, which can in turn lead one to wonder if the urban terrain leaves some of the unenlightened among us with an ingrained impetus to behave in a similar manner.